The common meaning of scarcity refers to unavailability in the market of a certain commodity. A commodity is scarce, in economic view, not due to itsd rarity in market but due to its means is limited. Scarcity explains this relationship between limited resources and unlimited wants and the problem therein. Scarcity raises national economic problems. There is poverty and human misery due to scarcity. Scarcity tells us about importance of commodity. The resources are not only scarce but they also have alternative uses. 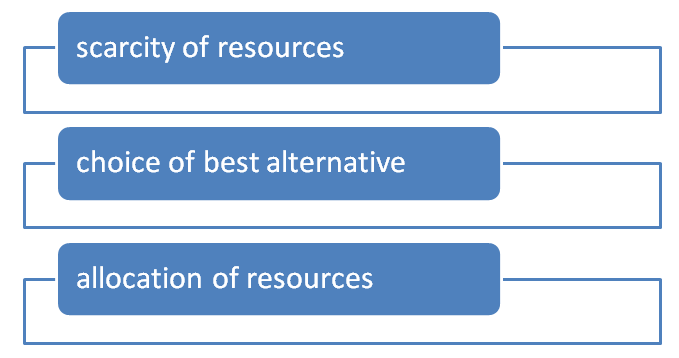 The resources mean all of the national resources, artificial resource and human resource itself. However the main economic problems are abused by scarcity of natural resource. The resources differ from place to place in their types, quantities and the qualities. They are usable for the production of varieties of goods and services to satisfy different human wants. But they are very in sufficient to satisfy all of human wants. Their supply is very limited and changeable with the flight of time. Their quantities and qualities may decrease if we don’t utilize them properly. Choice is involved in economic activities at both consumption and production levels. The problem of choice begins with an individual’s liking of how much time he would allot for work and how much for leisure. On the income earned, the choice is between how much to consume now and how much to save for the future. The chain of choice goes on deeper and deeper referring to the profitable use of resources at the hand of economic actors. The choice of best alternative is the selection of best combination of goods producible with the use of all of the resources available that gives maximum social benefits to the nation. The problem of choice is accused by limited resources and unlimited human wants. Since, each resource can be put for the production of varieties of goods; there is the possibility of large number of combination of goods producible in the country. However, they give more or less social benefit or utility to the nation. As per the requirements, importance or preference of human needs/ human requirements or importance of the goods the choice of best alternative is met. The allocation of resources means use of the resources dividing them for the production of the combination of goods that gives the maximum social benefit or utility to the nation. It is called appropriation of the resources to satisfy most important wants out of their unlimited types. The allocation of the resources is necessary because of insufficiency of limited resources for the fulfillment of unlimited human wants. Allocation is usually made to the basis of market demand or people’s preference on the goods. For it the concepts of demand and supply or the concepts of production possibility curve and preference curve of people are used. The resources have alternative uses. One use can be chosen and all other have to be satisfied. Allocation is related to the choice of how much of resource to be allocated in what sector. The whole body of planning, programmingand even budgeting is nothing, but the statement of allocation of resources. Resource allocation occupies central position in economics. Economics is the principle governing the allocation of scarce means among competing ends. A production possibilities curve is the graphical illustration of all the combinations of goods and services that can be produced in a given economy at a given time, if all the available resources in the economy in the economy are fully and efficiently employed. All points on PPC are points of maximum production efficiency or minimum production inefficiency; resources are allotted in such a way that it is impossible to increase the output of one commodity without reducing the output of other. d. PPC is downwardly sloped concave curve. To explain the concept of production possibility curve lat assume the country can produce one of the following combinations of goods utilizing all of the resources available as shown in the table below. In the above table there are six different possible combinations of butter and guns. If we represent them we obtain the PPC as shown in the graph. In the above figure, if production of butter is decreased from 15 units to 14 units, then the production of guns increase from 0 units to 4 units which signifies 1 pound of butter production decrement causes to increase guns production to 4. If production of butter is decreased from 14 units to 12 units, then the production of guns increase from 4 units to 7 units, which signifies 2 pound of butter production decrement causes to increase guns production to 3 and so on. The rightward shift in PPC indicates increase in production capacity of economy due to improvement in technology or new resources or both. 1. PPC says nothing about which goods people wants and which to provide the most satisfaction but only indicates about available options. 2. PPC are not related to preferences of consumer or producers so there is no economic efficiency. 3. It does not show if there is efficient use of resources. 1. Opportunity cost is shown by negative slope of PPC. 3. There is indication of unemployment, economic growth and investment.